Overview: This progression will help you develop a rock solid core and work the muscles in your stomach (the rectus abdominis and the obliques, as well as the stabilizing deep core muscles) both concentrically and eccentrically. Notes: Ultimately, this will lead to such exercises as the dragon flag (a favourite of Bruce Lee), the hanging dragon flag, the human flag, floor L-sits, and front and back levers. Choose one of the following variations as a starting point and perform 3 sets of between 4 and 8 repetitions with periods of between 1 and 2 min of rest between each set. When you can do 3 sets of 8, move on to the next exercise in the progression. 1. Flat knee raises. Lying on the floor, bring your knees up whilst keeping your legs bent at a 90 degree angle. Make sure to keep breathing throughout the exercise. 2. Flat bent leg raises. Lying on the floor, bring your legs vertical with a slight bend in them, then return without touching the floor. 3. Flat straight leg raises. Lying on the floor, bring your legs vertical, keeping them straight at all times, then return without touching the floor. 4. Forearm knee raises. With your arms resting on parallel bars, raise your knees till they are parallel with the floor, then return your legs to a hanging position. This exercise can also be performed with your arms resting on the back of 2 chairs (you can use 2 towels for cushioning). 6. Forearm bent leg raises. Similar to knee raises but performed with your legs at a 45 degree angle. 7. Hanging bent leg raises. As above, but hanging from a pull up bar. 8. Forearm straight leg raises. With your arms resting on the back of 2 chairs or on parallel bars, raise your legs straight till they are parallel with the floor, then return. 9. Hanging straight leg raises. Same as above but hanging from a pull up bar. 10. Hanging bent leg V-raises. Keeping a 45 degree bend in your legs throughout the motion, raise them till your feet are level with your head or higher. Keep your arms straight throughout the exercise. 11. Hanging straight leg V-raises (a.k.a. toes to bar). Hanging from a pull up bar, raise your legs straight, till they touch the bar, then lower under control. 12. Hanging fan raises. Bring your toes to the bar in between your hands, then bring them back down. That's one rep. Now repeat by bringing your toes up past your right hand, back down, then past your left hand and down. That's 3 reps. Here's the video demonstration. 13. Hanging V-raise windshield wipers. Raise your legs straight untill your toes touch the bar, then twist to one side and the other, before lowering your legs down again. That's one rep. Here's a video demonstration of the exercise. 14. One arm hanging leg raises. At first, use the other arm for balance, to prevent your body from rotating. Video demonstration. Sure you need a minimum amount of hamstring flexibility to keep your legs straight. But if -from a standing position- you can bend to touch your knees or mid-shins comfortably with straight legs, then you already have that flexibility. The problem lies more likely in the strength of your lower abs and hip flexors. 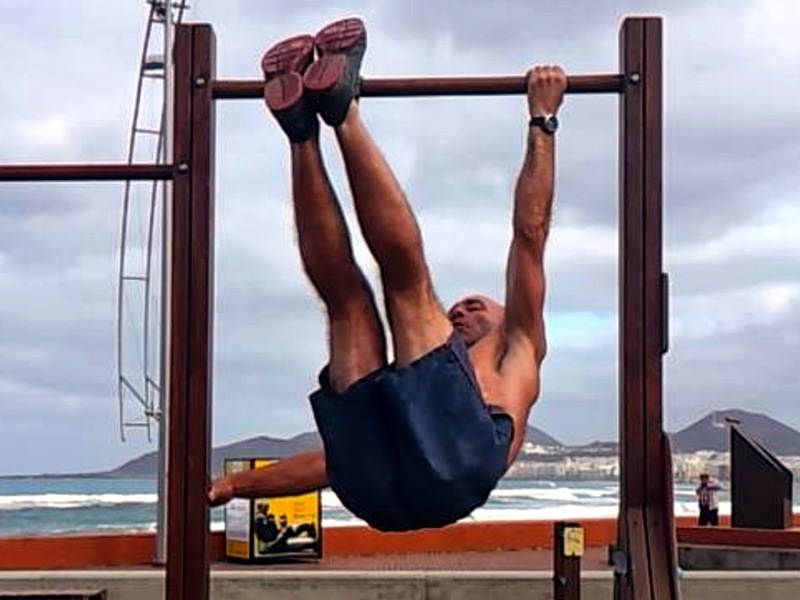 hey i've been using a neutral grip (palms facing each other) when i do hanging leg raises. is that ok? or should i build up to palms facing away from me? You might need a bit of tension to stabilize your body. This is absolutely fine. Awesome stuff. One question: on leg raises, when I lower my feet, do I keep them above the floor before starting the next raise? Touch the floor if you want to, as long as you don't bounce... And if you're talking about hanging leg raises, there is actually one big advantage to touching the floor: it will force you not to use momentum. No, I was talking about flat leg raises. I try to keep my feet about 6" above the floor at the down position. Thanks for all the work on this site! Similar question to mike keller, my grip strength is not strong enough to do 8 leg raises in a row without touching the floor. So it's okay to touch the floor after every rep? It's ok. As you keep practicing leg raises, pull ups and horizontal rows, your grip strength will improve. you can also train your grip by doing single-arm hanging for time. Use chalk to help with grip when doing the single-arm hanging. I don't have enough room to do progression #9 with full arm extension. I have a doorframe pull-up bar. Will it detract from the overall workout or encourage bad form if I do #9 from a half-pull-up position? It's not ideal, but if that's your only option, then go for it. Hey, thanks for your speedy reply! I wanted to make sure I wasn't going to hurt myself. As it stands, I'm between houses at the moment (crashing a friend's place short term), so I'll have the opportunity to find a place with so much more room for activities. Your exercise regimen with progressions is awesome; thanks for sharing your system with us! If my legs are not completely straight for the Hanging straight leg raises, is that a flexibility problem? Will I improve with time or should I try something else to help? Thanks! Hi, I have a question. I'm currently trying to fix my anterior pelvic tilt and I'm wondering if the progression listed here will help me with that since I've read that I need to work on my obliques a lot, or should I focus on other excercizes that are recommended specifically for fixing the anterior pelvic tilt before I attempt any of the stuff here? For hanging straight leg raises do your legs end up parallel to your torso or is it more of a 99 degree angle? Hey what do you think about isometric work, personally I feel more abs work when I stay in the position, repetition push me to move my legs more than contract my abs... what you recomend? or both are necesary? Just started this stuff, I noticed when I do straight leg raises my hip joints kind of dislocate with a loud thud noise. Is this something to worry about and what should I do about it? My hamstrings are too tight for the straight leg raises and I already progressed through the bent knee version. What should I do? im having a hard time with position 1. my lower back instantly lifts up and cant seem to extend past 90 to flat. any tips?